Simply stunning! You are looking at large size gorgeous floral necklace set. The whole set shines a lot! This necklace set is perfect for any special occasions. Necklace is approx. Earrings are for pierced ears, approx. Simply stunning! 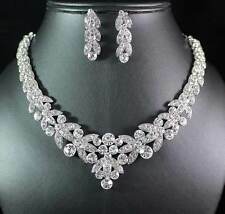 You are looking at elegant necklace and earrings set. The whole set shines a lot! This set is perfect for any special occasions. Necklace is approx. Earrings are for pierced ears, approx. Bridal Wedding Clear and AB -. Necklace & Earrings Set. Silver tone plated. Crystal Silver. Earrings: 1". Simply Stunning! 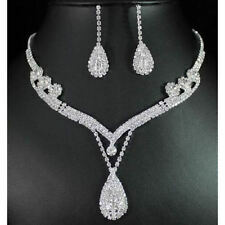 You are looking at elegant necklace and earrings set. The whole set shines a lot! This necklace set is perfect for any special occasions. Earring is approx. Necklace is approx. We will try our best to solve problems for you. Simply Stunning! 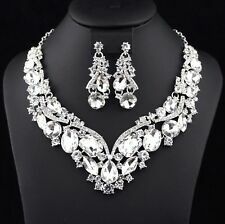 You are looking at elegant floral necklace and earrings set. The whole set shines a lot! This necklace set is perfect for any special occasions. Earring is approx. Necklace is approx. Material: gold/ plated, Crystal. The more you buy,the cheaper price will be. We must help you to solve the problem. Silver Clear Rhinestone & Green Bridal Party Necklace, Earrings Set. Earrings: 1"L. Double your traffic. Color: as picture showed. You Will Receive This Item even More Beautiful than The Pictures! Material:Rhinestone, Alloy. Fit for young and maturity female both. Set Included:Earrings Necklace. Earrings Size:4.8cm 2cm/1.89in 0.79in(Approx). Chain Length:30cm/11.8in(Approx). As different computers display colors differently, the color of the actual item may vary slightly from the above images. Onesie Dress. Baby & Kids Clothing. Party & Wedding Supplies. D O&Square Rings. Item type:Jewelry Set. Add to Favourites. Quality is the first with best service. We really feel very happy to make you content for our responsible service. Pendant Size: approx. 1.4 x 1.7cm. 1pc x Necklace. 1 pair x Earrings. Material: Alloy Crystal Rhinestone. Chain length: approx. I send goods within 12 hours. Usually I will respond in 24 hours. Wedding Prom Party Rhinestone Crystal. Material : Rhinestone. Necklace & Stud Earrings Jewelry Set. 1set( Necklace Stud Earrings). Necklace Size: about 32-50cm/13"-19.5" (Adjustable). Trending at $9.36eBay determines this price through a machine learned model of the product's sale prices within the last 90 days. 1 x necklace set (include 1 sets =1 strands necklace 1 pairs earring . quantity: 1 set (include 1 sets =1 strands necklace 1 pairs earring . color:Clear Rhinestone. earring length:5.5cm. 1pcs ring 1strands bracelet). ). Wedding Prom Pageant Dance Bridal Jewelry. You will receive one set. It has a necklace and matching pierced earrings. It is silver plated with clear rhinestones. Including one blue velvet jewelry bag Material:Stainless Steel Rhinestone Color: Silver Gold Weight:10g High quality stainless steel has high resistance to rust, corrosion and tarnishing, which requires minimal maintenance. Stainless steel is one of the most bio-compatible metals, so stainless steel jewelry is amazingly hypoallergenic because of its anti-allergic properties. As one of the strongest of all jewelry metals, it does not oxidize and will be very durable. All makes it a top fashion accessory to complement your wardrobe with the sleek, contemporary styling offered by our stainless steel jewelry..
Silver Royal Blue Formal Rhinestone Crystal Necklace Set Bridal Wedding Prom # 9761 New. Wedding Prom Pageant Dance Bridal Jewelry. It is silver plated with royal blue and clear rhinestones. You will receive one set. Silver Clear Rhinestone & Red Ruby Bridal Party Necklace, Earrings Set. Earrings: 1.1/4"L. Double your traffic. Color: as picture showed. Simply stunning! You are looking at floral necklace and earrings set. The whole set shines a lot! This necklace set is perfect for any special occasions. Necklace is approx. Earrings are for pierced ears, approx. Simply Stunning! The whole set shines a lot! This necklace set is perfect for any special occasions. Earring is approx. Necklace is approx. We will try our best to solve problems for you. United States. Music Note Jewelry Set Flower 18K Yellow Gold gp Crystal Necklace Earrings Ring. Belief 3X Of Set Jewelry Cross 18k White Gold Crystal Necklace Earrings Ring. 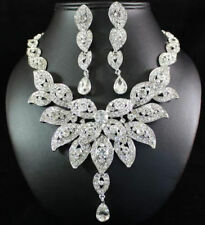 Prom Wedding Bridal Party Crystal Rhinestone Necklace Earring Jewelry Sets Gifts. Simply stunning! You are looking at pearl and rhinestone necklace set. All rhinestone shines a lot! This necklace set is perfect for any special occasions. Necklace is approx. Earrings are for pierced ears, approx. PAPARAZZI JEWELRY~Woman's Necklace Sets With Earrings YOU CHOOSE! Earrings: 1"L. Double your traffic. Pierced with bullet disc backs. Color: as picture showed. And we will try our best to resolve the problems. SPAIN: AM 2:00-AM 10:00. Brazil: PM 10:00-AM 7:00. France: AM 2:00-AM 10:00. USA: PM 6:00-AM 2:00. UK: AM 1:00-9:00.